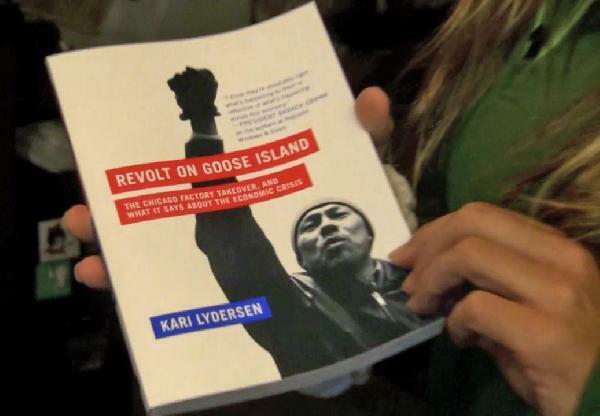 Kari Lydersen has penned an absorbing book, “Revolt on Goose Island.” It chronicles how 250 members of the UE, a progressive union, occupied a factory, “Republic Windows,” located in Chicago, IL, rather then just meekly submit to its closing. It’s labor history at its best. This “direct action” came not long after AFL-CIO labor leader Richard L. Trumka denounced the evils of “globalization,” and the predatory schemes of the Wall Street boy-ohs. It’s clear that the UE won the day at “Republic Windows.” Its demands were met. The company, however, was sold recently to another outfit, “Serious Materials.” The victory, Ms. Lydersen’s emphasized, did raise the “consciousness” of other blue-collar workers, and even also of “white-collar professionals” caught up in the same kind of painful economic squeeze play. Will the “direct action” at the Goose Island factory become a “potential harbinger of a revitalized and reinvigorated labor movement in the U.S.?” It’s too early to say. However, if Trumka can’t galvanize the AFL-CIO to take on the Wall Street boy-ohs to reverse their disastrous policy of globalization, [via the Obama Administration], then it will not bode well for either the cause of Labor or the future of a vibrant American Republic. Finally, read Ms. Lydersen’s book about a triumphant chapter in American Labor History and exactly how it was accomplished. It deserves to stand on its own as a beacon to the resilience and courage of working class people and to their union--the UE. 2. “The Revolt on Goose Island: The Chicago Factory Takeover, and What It Says about the Economic Crisis,” by Kari Lydersen (Melvin House, $16, 176 pp, soft cover). ©2010, William Hughes, All Rights Reserved.